Recently, we’ve been talking a lot about about women’s health and hormones and the things that can wreck them. Did you know that makeup can be a huge source of hormone-wrecking toxicity? If you’re wanting to make the switch to safer, more natural eye makeup, I’ll give you my best mascara suggestions below. Honestly, mascara is one of my favorite beauty items. Ya know, along with a good BB cream, blush, bronzer, and eye shadow. Ok, so it turns out I really like makeup. But it’s hard to prioritize makeup in the midst of busy days with kids, making healthy meals, homeschooling, and spending most days in sweat pants. Let alone choosing quality, toxin-free makeup. I felt guilty spending money on myself or even taking the time at the grocery store to stop in on the beauty aisle to try and grab some random, organic mascara while my boys pinched and smacked each other in the cart or wandered off to the gluten-free pizza aisle. But natural eye makeup makes me feel good. It just does. A swipe of nice mascara on my peepers makes my eyes look more lively and just makes me straighten my shoulders a bit higher. Ok, I know Audrey isn’t talking about eye makeup here, but the eyes are important. They are indeed the window to our soul, and I like my windows to look lovely when they can. So I set out to find natural eye makeup options. For years, I worked as a cosmetologist, using toxic chemicals on client after client’s hair, and using toxic makeup and skincare products on their skin. Which means I was being exposed to chemicals all day long at my job. So when I went the natural route with food, cleaning products, and lifestyle in general, I knew I wanted safer options for my beauty products too. It was a slower process with my makeup, as I felt like it wasn’t as big of a deal as food, plus I had a hard time deciphering and finding good, natural products. I was wrong. Our skin absorbs the stuff we put on it, which means it goes into our bloodstream, and has the ability to impact our health as much as the food we eat. When I learned about how important it truly is to choose safer products, I began switching out all my makeup for healthier options. Let’s look specifically at mascara ingredients and why we’d want to choose natural eye makeup. Formaldehyde- released by preservatives found in mascara and other beauty products, formaldehyde is a known human carcinogen. It can also cause respiratory disturbances like coughing and wheezing, and may cause burning, watery eyes, burning in the nose and throat, nausea, and skin irritation. Phthalates- found in synthetic fragrances, phthalates are responsible for a host of health issues, most notably infertility and birth defects. So what’s a beauty-obsessed girl to do? 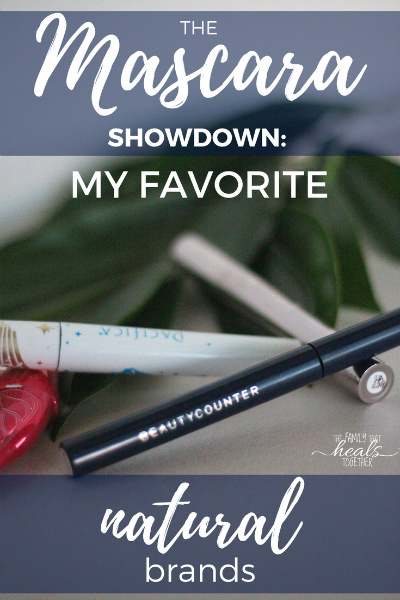 Over the years, I’ve tried several natural mascara brands, and I’m happy to break down my favorites for ya! I’ve judged them based on ingredients, price, and performance, so you can make the choice that works best for you! I’ve also starting using another popular botanical mascara, 100% Pure’s Maracuja Mascara, and have been pleasantly surprised with it as well. Performance: The marajuca mascara gives a nice definition and the blackberry color that I’ve been using has a nice pop of subtle, deep purplish color. 100% Pure selects safe, botanical ingredients, including herbal preservatives like oregano, thyme, and rosemary. Bottom line: I’m 100% comfortable using their makeup! Get 100% Pure’s Maracuja Mascara here. Another natural mascara I’ve been using for a while now, I’ve been really happy with the Pacifica Beauty Dream Big Mascara. Pacifica is a safer brand that sources some botanical ingredients. They make divine-smelling perfumes, but I’m unable to find for sure whether or not they use phthalates, unfortunately. Performance: The Dream Big mascara is a fun, unique mascara because it’s a lengthening and volumizing mascara in one. First, you lengthen, then you twist the wand to shorten it and add volume. Or maybe it’s the other way around. I don’t know. I honestly usually only use it on the lengthening setting. Overall, I’ve been happy with how it looks and holds up. Recently, however, the tube broke, which is a bummer because it probably has months of use left in it. You’ll see the ingredients aren’t perfect, but it’s free of parabens and seems to be free of phthalates and the other harmful ingredients we discussed and also contains some lash-nourishing ingredients like jojoba. Bottom line: I feel fine using it, but there are cleaner options. Get Pacifica Beauty Dream Big Mascara here. I’ve bought organic and natural mascaras at the grocery store for years, but have never been very impressed with their performance. The one I most recently purchased was Physician’s Formula Organic Wear 100% Natural Origin FakeOut™ Mascara. 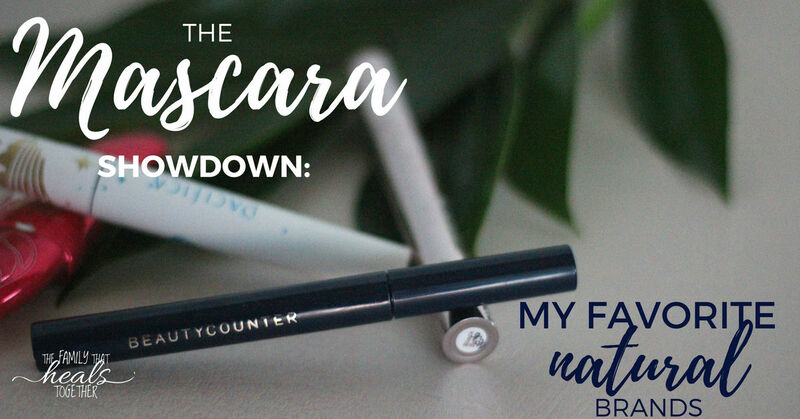 Performance: While it looks about as nice as any other mascara, I was appalled to find that it often smeared and smudged after a couple hours. Nothing like walking into the restroom between classes at homeschool coop and discover you’ve got a raccoon eye thing happening. It was this mishap that ultimately sent me on a mission to find better natural eye makeup. The ingredients are pretty clean, but I do note there are corn and soy products, making it less allergen-friendly than other natural options. Bottom line: I personally felt fine using it. What’s your favorite brand of natural eye makeup and mascara? Share your picks! Hi Jaclyn! I have been working on changing over my makeup also. It is not that easy to find things that I feel are safe and that work well! I have been using ecco bella’s mascara. It has a great score on ewg.org. I also found some of their heavy metal testing results for some of their makeup. They had very low levels of heavy metals (lower than I have found anywhere else so far, and I have looked!). Also, I just bought some Pacifica perfume and their website states that “they are free of phthalates, nitro-musks, benzene, and other things you don’t want”. Thank you for the review! I am going to pin this! Thanks for that info, Kristie!